We left Fort Lauderdale Monday afternoon bound for Panama, with about 1100 miles still to go. After transiting the canal, we plan to sail nonstop to Tahiti, about 4500 miles. In Tahiti we shall join the boats in the Blue Planet Odyssey round the world rally, and continue west towards Australia and Torres Strait. For these long passages I am accompanied by two crewmembers. Dunbar Lewis, who is 38, joined Aventura in October last year. He is a keen sailor having started sailing while growing up in South Africa. He studied accountancy at Cape Town University and in 2003 moved to London. 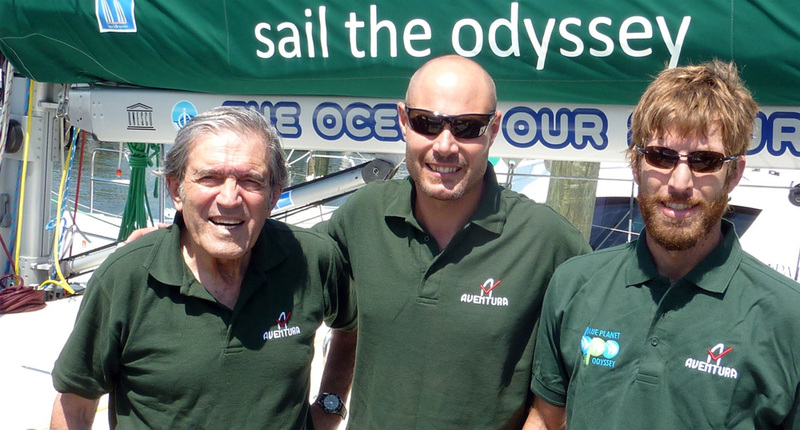 He sailed last year in the European Odyssey on his Dockerell 26, which he sold in Mallorca to join Aventura. Dave Keefe, 29, is American. He took up sailing after having graduated in Liberal Arts from the University of Colorado, and getting a job as barman on a 60 foot catamaran doing charter work in the Virgin Islands. He quickly progressed to captain and worked on various boats in the Caribbean. Last November he sailed his Cal 20 from Los Angeles to Hawaii, and, like Dunbar, sold his boat to join this voyage.